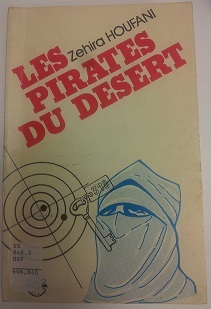 Les pirates du désert (Pirates of the desert) is a detective novel, written by Algerian author Zehira Houfani. Houfani was born in 1952 in Kabylie (M'kira). She moved to Canada in 1994 and continues writing. Zehira Houfani published her first novel Le Portrait du disparu [Portrait of a missing person] in 1984, with ENAL eds. Then came Les pirates du desert (ENAL, 1986), followed by L’Incomprise [A woman misunderstood] in 1989 (ENAL). Since then, Houfani seems to have only published non-fiction. Her latest book Jenan, la condamnée d’Al-Mansour [Jenan, the convict of Al-Mansour] was published in 2008 and recounts the bombings she experienced while working in Iraq for an NGO. Les pirates du désert (Pirates of the desert) is a light, and entertaining detective story set in Tamanrasset where Omrane, the political representative of the Algerian government there, is trying his utmost to stop crime in Tam, but to no avail. A gang has rapidly grown from small time rackets to large-scaled and well-planned illegal operations. It has now created a parallel market in the area, over which it rules. All the agents Omrane has sent after the gang have died in suspicious circumstances, and he begins to suspect that someone is sabotaging every one of his counter-operations. He writes to the authorities in Algiers, who know the illegal trade is not only affecting Tamanrasset but is a widespread phenomenon quickly swallowing up all of Algeria. They are quick in responding and send him super star Special Agent Salem. Salem together with Omrane's top detective Taibi, go after the gang to find out who are its members, to uncover the identity of the one they call the Mayor. Salem and Taibi turn out to be more lucky than intelligent. It is because they scare Wahiba out of her wits that they are able to get all the information they need for proofs and arrests. They don't torture Wahiba, she's smart and knows when she's been cornered. Besides, Salem, her interrogator, is just too good looking to resist. The story is told in very innocent terms even though we're dealing with criminal activities. These activities remain untold in fact although something to do with trucks is mentioned. Only the character of Wahiba hints at what crime actually entails. Wahiba is a madame who began to work for the gang so that she could come out of the prostitution world into which poverty had condemned her years before. Tamanrasset is portrayed as a place where profiteering is as rife as the poverty it creates, and this is forcing people to chose between starving or theft. The innocence and lightness of this detective novel makes me think of Enyd Blyton's Famous Five stories. Great for teens - although the Algerian novelist Chawki Amari says in Algeria we're teenagers until 50. But then again, many Algerian detective stories were written in that innocent and unoffending way, and even some today. At this moment in my readings, Houfani is the first woman writer I have come across to have published a detective novel in Algeria. She seems to be the woman pioneer in the genre. For more DZ detective novels, see Algerian Detective Story Writers' Top 10.